Turkish Journal of Agricultural Research is a peer-reviewed journal published by Siirt University, Faculty of Agriculture. 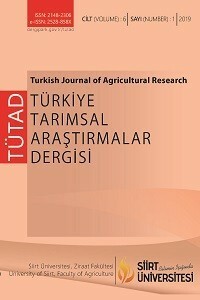 Turkish Journal of Agricultural Research publishes original research articles generated from studies conducted in all agricultural areas especially in Horticulture, Field Crops, Plant Protection, Agricultural Structures and Irrigation, Agricultural Economics, Agricultural Machinery, Agrology and Plant Nutrition, Agricultural Biotechnology and Animal Science. In addition, reviews in current issues of particular importance are published. Journal published in Turkish and English as open access. Turkish Journal of Agricultural Research do not charge any article processing fees over publication process. Articles passing pre-evaluation by editorial board, evaluated with double-blind peer review system. Every article published in the journal since 2014 has given a DOI (Digital Object Identifier) number. Turkish Journal of Agricultural Research is licensed under a Creative Commons Attribution-NonCommercial-NoDerivatives 4.0 International License.